According to many religious traditions and New Age beliefs there is always an incarnation of God alive on the planet living as a divine human being. One and One only! These avatars or "Satgurus" include Jesus and Krishna. According to Prem Rawat, Prem Rawat is the Perfect Master of this present age. Historically, the Miracle of Incarnation has been shrouded in mystery but thanks to modern technology we now have the majestic story of the process of divinisation available from Prem Rawat's own mouth as it unfolded for all mankind … assuming his story is true. Unfortunately this history was revised by Rawat decades later to a far less interesting and more mundane story which makes both stories unlikely to be true. Prem Rawat or Maharaji the Ultimate Ruler formerly known as "Guru Maharaj Ji" now claims to be a mild-mannered inspirational speaker living in well-deserved luxury in Malibu who works tirelessly to bring people the possibility of perfect peace and bliss. 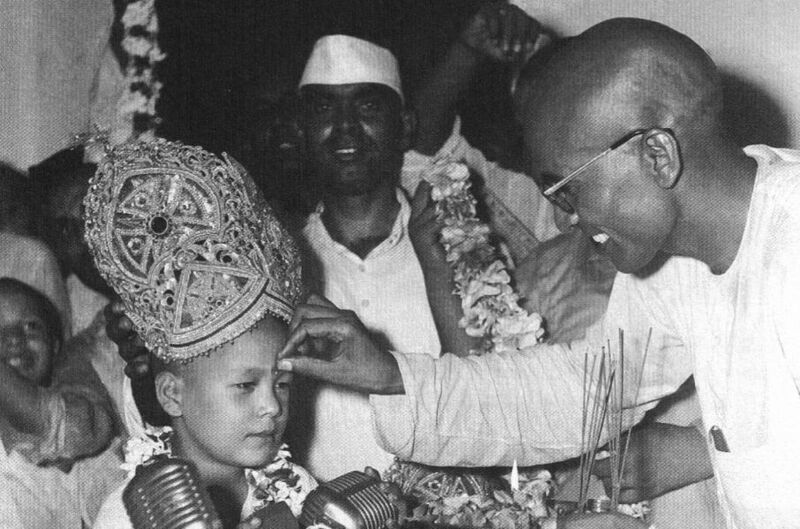 His father was Shri Hans Ji Maharaj a descendant of Indian Royalty and the living incarnation of God of his time. 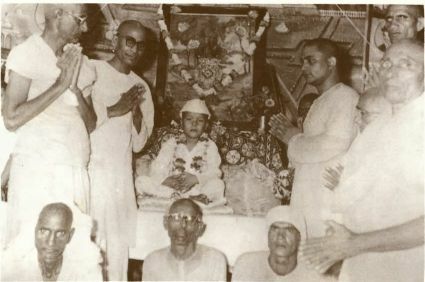 The process of Prem's incarnation, as he described it often, began on July 19th, 1966 when his father left his body in samadhi (died) and ended on August 1st to the ecstatic recognition of him as the new Perfect Master by thousands of his father's followers in the party of the century. On the 19th July, at three o'clock, Shri Hans Ji Maharaj (the Guru Maharaj Ji of his time) left his body (died). He had left a letter in which he sent his love to his oldest three sons and obeisances to his youngest thereby showing his wishes re the succession. 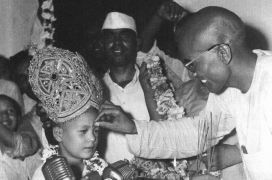 It is not unusual for minor Indian gurus with property to be succeeded within the family but this may be the first time that the true Satguru has been succeeded by his son or daughter. Buddha and Jesus, for example, had no children. Prem Rawat was at school in Dehra Dun. The chauffeur came to fetch him. Everyone was weeping. I was just sitting there, not weeping. Something began to happen to me. I began to feel that I am not this body; that I could not move these lips." He points to his lips. "I always thought that the soul would leave by the mouth, but my mouth was shut. Still, I felt I was leaving my body and my soul was everywhere going out. And this voice came to me saying: 'You are he, you are the one to continue.'" On the 29th July, Prem Rawat demonstrated meditation and told in satsang that he would "unite all religions" by spreading the same Knowledge that Jesus and all Perfect Masters taught through the Mahatmas for without those great souls it cannot be done. "Here was Shri Maharaji himself, they decided, dancing before their eyes, with the same radiant grace, glorious smile, and shining eyes. What really occurred that evening remains a mystery, something that words cannot describe. People say it was as if father and son were one and the same in front of them, as if time and death had been suspended for a moment and life was manifesting in an eternal moment of glory." 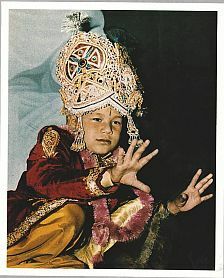 Miraculously, there was a "Lord of the Universe" crown lying around that was the right size and the young Prem Rawat was declared the new "Perfect Master". On the 1st August when going to immerse his father's ashes in the Ganges, the voice came to him again: "You are he. You are the one to go and give this to the world." That night "For the first time," says Guru Maharaj Ji, "I did not give satsang. The satsang just came and I began to speak: Dear children of God, why are you weeping? Haven't you learned the lesson that your master taught you? The Perfect Master never dies. 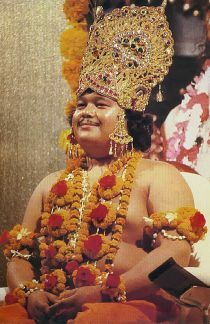 Maharaj Ji is here, amongst you now." Immediately his mother, three elder brothers and all the mahatmas present, prostrated at the feet of the Perfect Master and received his blessings. See, after one Master, the power of his spirit is transmitted. That holy spirit of Knowledge is transmitted to another body, whom the first body thinks is capable. As in many offices. Suppose I'm an employee. Hmm? And I am to resign. And I am really a very faithful employee. I go to the owner and the owner says, "Well, okay, you want to resign. Now go and find a man like yourself." I go and search for him. In the same way, the Master who has been perfect knows who has to be the next man, who's capable of this, of receiving this authorization. And then, after him, the power is transmitted to him. And he fully agrees with that. Transcripts of the public speeches or "satsangs" of the young Prem Rawat on the 29th July, 1966 and the 31st July, 1966 when he revealed his incarnation were printed in 'The Golden Age' the magazine published by Divine Light Mission, Australia in the 1970's. The text of the "satsang" of the young Prem Rawat on the 29th July, 1966 is also available as published in the Divine Light, Volume 2, No 2. The full "authorised" story of the Incarnation of Prem Rawat was published as "The Unbroken Garland" in the special Millenium Issue of "And It Is Divine" in 1973. It included Prem Rawat's Satsang of the 29th July and his mother's satsang of the 31st July, Prem Rawat's Satsang of the 31st July and his eldest brother, Bal Bhagwan Ji's Satsang of the 31st July. An interview with Prem Rawat published in the New York Times of the 8th of April, 1973 includes discussion of the incarnation and this is also published in the book Gurus, Godmen and Good People by Khushwant Singh, the respected Indian journalist, editor and author. Details of the Incarnation were also published in the Divine Light colour magazine And It Is Divine in an article about the history of Prem Rawat and his Holy Family. A revisionist summary of the events is published in "Peace Is Possible", the authorised biography of Prem Rawat, the only book published by Mighty River Press. This story, which Prem Rawat is touting 40 years after the events, minimises the astonishing supernatural aspects of the event and attacks his mother and eldest brother with unsubstantiated aspersions on their character and actions while showing his in a hagiographical manner. Prem Rawat explains the lineage of the incarnations of God and their importance and functions in modern, scientific terms. Unfortunately Prem Rawat has published very little or no information about his early life since the destruction of the 1970's publications in the early 1980's. However brief introductions to Prem Rawat's life and career and Prem Rawat's arrival and early activities in the "West" are available. His early childhood is described in the Divine Times Volume II, No. 23 - December 11, 1973, a magazine published by Divine Light Mission. Further newspaper articles about Prem Rawat's life and astonishing if pointless career are available on the Web. 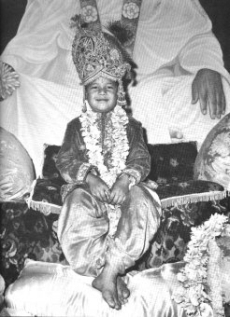 There are video clips of his father, Shri Hans, on this site and his life and work are detailed in the Hans Lok Web Site dedicated to one of Prem Rawat's elder brothers, Shri Bhole Ji.